One of my favorite things to do is to decorate my home. The process never looks like a designer’s dream though. Almost never has it involved buying new furniture or high end decor. I’ve had the pleasure of investing in a few big ticket items over my 25 years of creating a home, like sofas and some bedroom furniture, but the rest has been gathered over time and had a home before it belonged to us. In fact, everything I learned about creating a cozy home for my family came from working within my limitations. In the early years, I would buy a gallon of paint to refresh a room since we could never replace or remodel anything. I would move the few furniture items we had to new places, trying desperately to get the look I wanted. Often I would throw my hands up in the air and, half laughing/half crying, declare that I was just rearranging the garage sale display! Nowadays, my house is furnished with a few things we bought new, most that I gathered used and a collection of inexpensive decor collected or made over time. I remember when I was young wondering how in the world my mother in law had managed to collect so many beautiful things - books, plates, candles and other decor items. Her home and cabinets were a treasure trove of beautlful things. I loved it all! 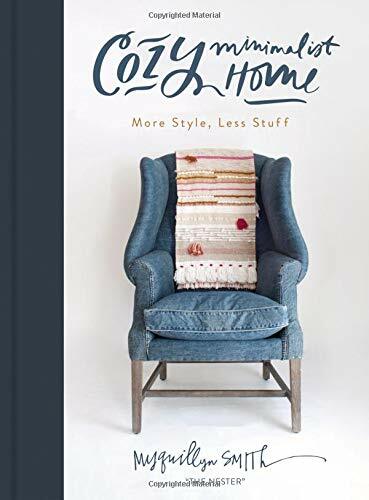 I know now that 25 years into the homemaking gig, if you’ve gathered little things you love here and there, that you can have a collection of meaningful items that are beautiful and special to you and that it will be better then all new, all-at-once, on trend everything. 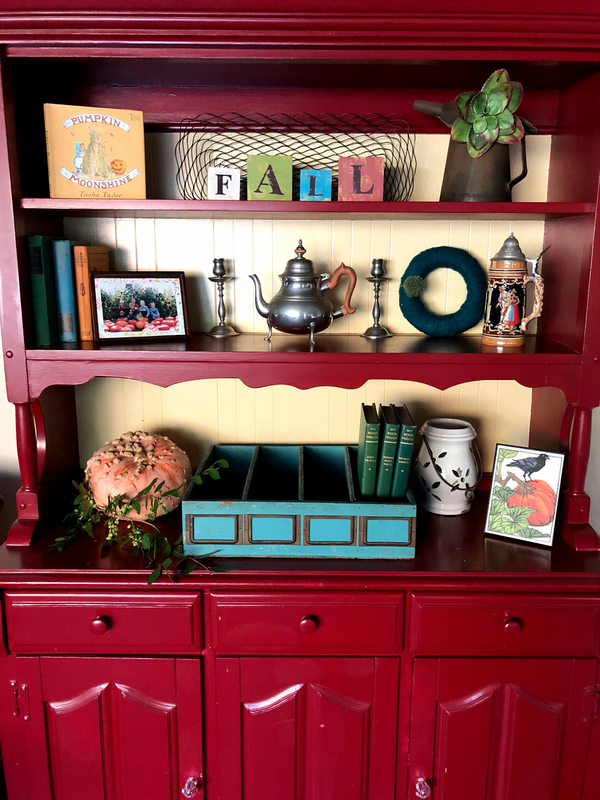 So now, when the seasons change and I have time to putter around the house changing up the decor, it’s still not perfect or new or on trend but each little item I put out is special, curated and full of memories. Here are a few vignettes I created this week in our home. For more ideas, grab my FREE Guide: 4 Ways to Create a Home you Love. A favorite children’s book, pewter pieces from a dear friend, a photo of my children when they were little, old books from a neighbor’s yard sale, yarn wreath made by my daughter, an old French drawer, an old oil can, and a card from Trader Joe’s taped to a frame. 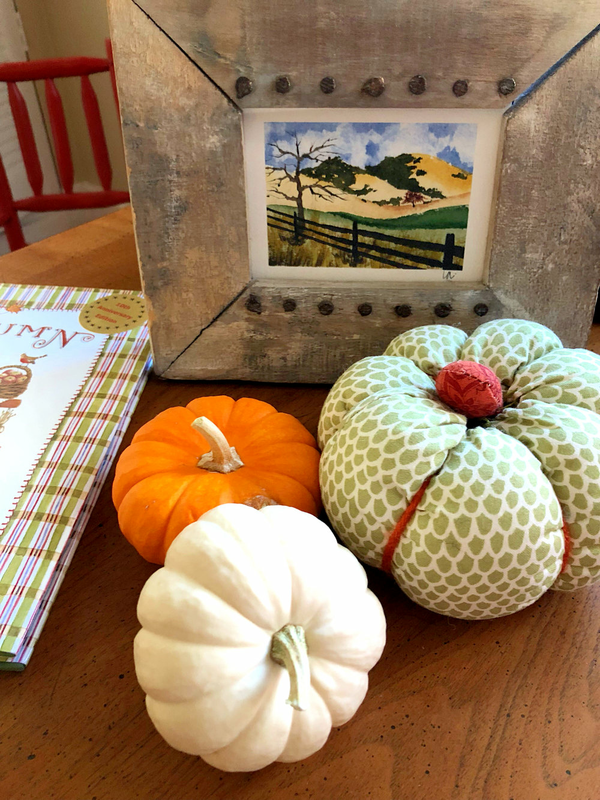 Tabletop beauty: wooden tray - Southern Living Home, old books from neighbor’s yard sale, antique shoe mold - a gift from my sister, a German beer stein, green balls from Homegoods, real white pumpkins from Trader Joe’s. A few touches of Fall color change this room with the season. The striped chair is a roadside find with a PB curtain over it. Curtains - calico corners fabric sewn by a friend, end table, lamp, bust - consignment, oil painting by my grandmother, sofa - Flexsteel, pillows, rug and coffee table - Pottery Barn, string lights because we don’t have overhead lighting. Watercolor of Mt. Diablo and frame was a gift from a sweet family member, fabric pumpkin made by my girls. Real pumpkins from Trader Joe’s. One of the people who has influenced my style and more importantly, helped me LOVE my imperfect home is Myquillan Smith - aka, The Nester. I found her blog about 10 years ago during a time when my kids were little, the days were long and we were renting a run down old ranch house. We had no money to make it pretty. I’ll never forget the first of her blog posts that I read. It was about making window “mistreatments” and it involved her standing on her kitchen counter and using her shoe to pound a nail through a piece of fabric to make a curtain for her kitchen window. I was inspired and I no longer felt alone. She uses a great hashtag on Instagram: #idhtbptbb - it doesn’t have to be perfect to be beautiful. Isn’t that so true?? It took an attitude shift for me to start appreciating the simple little things I’d been able to gather over the years to not dismiss them as junk or not “real decor”. The whole purpose of creating beauty in our homes should be to tell a story, to remind us of moments and experiences and to invite us to engage in the most meaningful activities. It doesn’t matter that a chair came from the side of the road - it matters that people have a place to sit. 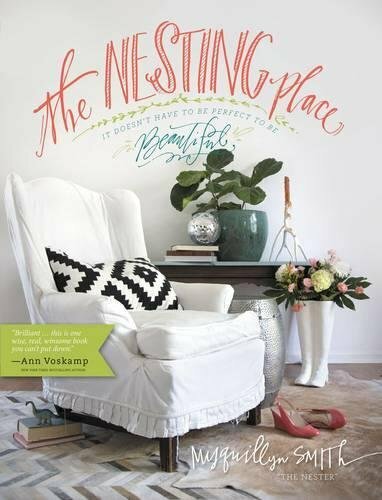 The Nester’s latest book is about creating a beautiful home without so much STUFF. I’m reading an advance copy right now and I love it. It’s available for pre-order and there are some great bonuses if you pre-order by a certain date. I hope you feel encouraged and empowered to embrace the imperfect and use what you have to create a home your family loves. For more ideas, grab my FREE Guide: 4 Ways to Create a Home you Love. Set for Thanksgiving with a fresh branch of persimmons.